With so much going on in the world of IT service management (ITSM), and the wider IT management space, it’s easy to neglect some of the ITSM or IT management basics (and I feel your pain). Take Windows PC deployment as an example – are you still doing this the same way you’ve done it for the last ten years (or longer)? My blog wants to help you to address this. So please read on to understand what your IT department could be doing with its new Windows PC deployments. 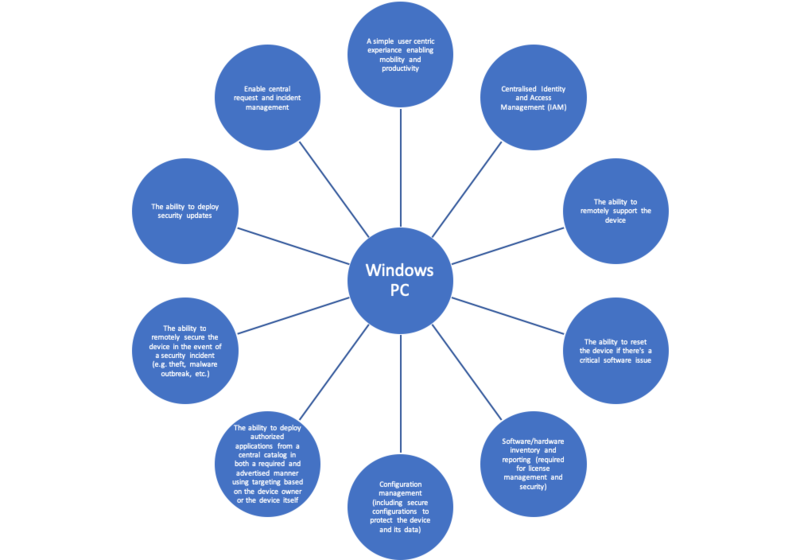 Historically, companies have often had problems with Windows OS endpoint management. The original equipment manufacturer (OEM) devices would roll out with more bloatware than Jabba the Hut could deal with – giving the IT department a headache from day zero. Combined with the fact that a lot of organizations aren’t green fields and already have a fleet of devices “out in the wild” that need managing (which may not be built to the required standard or be up-to-date). Then, conducting a “big bang” refresh isn’t always the right option for some organizations. All in all, the overheads of Windows PC management have traditionally been pretty high! When it comes to Windows deployment and device management there’s a whole raft of considerations to be made regarding PC imaging, re-imaging, supporting infrastructure, and the network; and then the age-old issues related to applications and drivers (and their ability to work properly). Heck, and I haven’t even touched on the data challenges yet. All these options then have the question of: Do we deliver straight to the end customer or to IT to then handle distribution and deployment? So, as you can probably tell, this isn’t for the faint-hearted and there are a lot of design considerations. Rather than break down into every detail, I’m going to instead look at abstracting the capabilities that your IT department might require for a Windows business desktop deployment. I did warn you that there’s a lot of overhead. In my diagram, I’ve tried to stick to capabilities that are required by most organizations, there may also be other ones specific to your business. However, my pictorial list should cover the core areas that I’ve experienced across a range of organizations and IT departments. Realizing that Windows PC deployment and management not only costs businesses a great deal of money but that it’s also inconvenient for the person using the device is important here. In general, the device is being used as a “means to an end,” the interface through which to enable someone to do their duties with the ability to have a level of personalization. So, surely Windows PC deployment should be simpler, say like the mobile phone set-up experience? Enter the capabilities offered by Windows Autopilot such that, for the first time, we’re stepping nearer to being able to deploy Windows devices without huge layers of supporting systems, engineering, and infrastructure. Either the OEM, partner, or your IT department can pre-load a list of authorized devices, assign them to people, and have the device simply be turned on without having to wipe and load the device. It will allow the user to join the Azure Active Directory, will enroll into Intune, and do so as a limited (non-administrator) user account. I’ve been test driving this in the lab and, so far, I’m impressed (and not just with how I look in a lab coat). There are, however, some harsh realities I need to acknowledge. This leads us back to the capabilities I went through earlier. With Autopilot (at the time of writing) there are a few gaps in this model. Software inventory Yes With third-party services, e.g. Snow, SysAid, etc. Now I’ve picked a few areas here to highlight that the Microsoft Cloud Management route, using Windows Autopilot and associated services (Intune/O365/Azure), provides some of the story but to get the complete “novel” you need to augment and extend this with third-party services. So, in a cloud, mobile, and user-centric world we want to ensure that we can enable our people without necessarily taking on, or continuing to have, a high central PC-management overhead. The technology and options that cloud brings means that this is clearly possible, and Microsoft has taken huge steps to changing the way Windows can be managed (for the better). However, there’s still some legwork that organizations will need to take for this to work today. Will the Autopilot route fit some organizations and use cases? Absolutely. Does it tick every box right now? I’m afraid not. But then is avoiding the cost of engineering, infrastructure, and support worth accepting the capability gaps? Perhaps. Can you also augment the gaps with additional cloud management tools? Sure, it’s an option that I’d be looking at right now. You might find that you can achieve the same or better business outcomes without the headaches and the costs. One thing is for sure, with cloud and mobile, doing things the way that you used to is being turned on its head!